Contrary to popular belief, a high-quality mountain bike doesn’t have to cost an arm and a leg. There are plenty of options for those that are just getting started or don’t want to break the bank getting the bike they need. While big name brands are popular for a reason, bikers can get a similar, if not better, riding experience out of a bike they build on their own. Building a custom mountain bike from scratch offers a number of benefits. Not only is it much cheaper than buying a pre-built bike but it allows riders to customize the bike to their particular riding style and preference. Whether you’re a novice rider or a skilled biker that can dominate any trail, it’s good to plan ahead for a smooth build. Not all bikes are the same, so there’s a lot to consider prior to building. To ensure that the unit suits your riding style, you’ll need to consider where and how you will be using it. There are many types of mountain bikes and a variety of different trails that call for different pieces of gear. 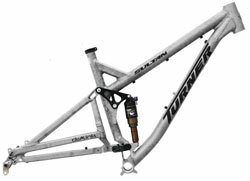 Different frame designs are used on specific styles of riding, such as cross country and all-mountain. Choosing the style of riding you will be doing with the bike is the first step in the build. From there, it’s important to consider how much money you’ll put into the build. While it may be tempting to get top-of-the-line parts for the bike, it’s not always the best idea. For example, simpler and more affordable parts will make the bike easier to ride and understand. It’ll also allow new riders to adopt appropriate handling skills that will prove to be beneficial in the long run. Sometimes, it’s better to start off small and save up for upgrades as your skills improve. 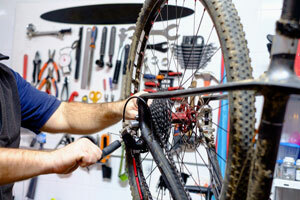 Building a custom mountain bike allows you to save money upfront. A brand new bike from even a modest brand can set you back thousands of dollars. Prices only go up with upgrades and improved quality. While cheaper alternatives do exist, they come with a risk. By building a bike from scratch, you have ultimate control of what you are spending. You will know what every piece of gear costs. Separate parts tend to cost much less without a brand name attached. Furthermore, you can mix and match parts from different manufacturers. In pre-built bikes, every part is made by the same company. This provides little leeway when it comes to price and quality. By mixing and matching parts, you can save more and personalize your ride. 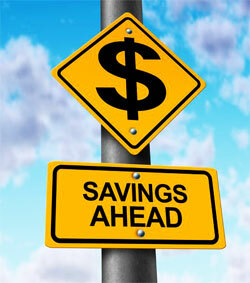 One of the easiest ways to save money on your build is to buy used parts. Some components work even better once they’ve been broken in. With a bit of extra work and attention, most parts can be restored to their former glory. For example, brakes can be renewed by installing some new pads. Servicing the used components will dramatically improve the longevity and reliability of the parts. With that being said, not every part should be second-hand. Some components are better when they haven’t been through a season of riding. This includes gears and intricate parts. The best and most effective builds make use of both new and used parts. It’s important to plan and budget ahead to have a better understanding of what areas need more money and investment than others. Building a bike isn’t rocket science, but it’s always a good idea to be under the watchful eye of an experienced rider. Seasoned bikers can guide you in the right direction and offer some useful building tips. Bike shops are a good place to start to get help with the mechanics of the build. Furthermore, bike shops are a great resource for finding used parts as well as connecting you with fellow riders in the area. 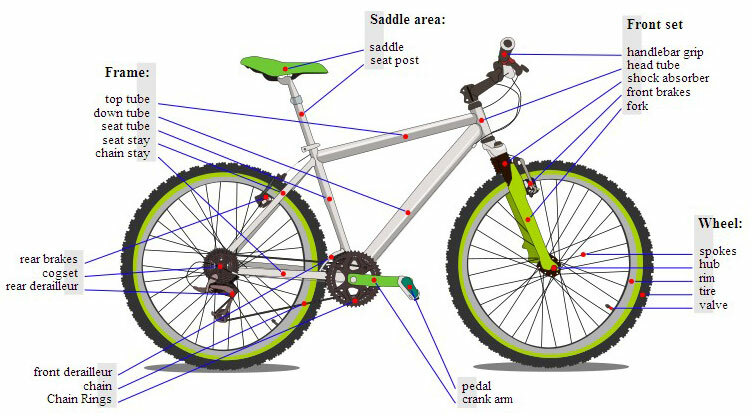 While mountain bikes may look daunting due to their numerous parts, they are relatively simple machines. There are a number of essential parts that make up the build. Within each category is a number of different design choices that will vary based on your needs. The frame is the most important part of the bike and often the first consideration. Frames can be made from a variety of materials, such as carbon fiber, steel, or aluminum. The main goal of the frame is to support all of the other components while remaining light and strong. When it comes to sizes and designs, the options are endless. It’s important to choose a frame for your size and riding style. Aluminum frames are a great place to start, as they are light and affordable. The front fork is what holds the front wheel. Typically, the front fork will house some sort of suspension system to absorb the shock of the trail and provide a smoother ride. Shocks can utilize a metal coil or air to absorb the shock. Suspension systems have different levels of travel depending on the particular riding style. While front suspension systems are common, many riders do forgo it for more control and improved handling. 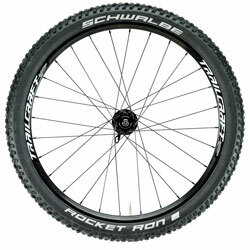 What good is a mountain bike without high-quality wheels? Choosing the right set of wheels can have a huge effect on your ride. Typically, wheels made for mountain trails are thick and tough. This is to accommodate rough terrains that would otherwise destroy wheels. However, tougher materials are allowing wheels to become thinner and lighter without sacrificing durability. Wheels are made numerous parts, including the rim, hubs, and spokes. Different materials, sizes, and construction methods have an impact on the overall quality of the wheel. The rim should be large and made of sturdy steel while the spokes can be made of softer metal, such as aluminum. Also referred to as the saddle, the seat is an important component that can affect comfort and performance. While new riders may go with the softest option, that doesn’t necessarily mean its the best fit. Seats should be adjusted perfectly for your body and riding style to avoid soreness. Factors like height, weight, and body position while riding should be considered when choosing and fitting a seat. These factors also apply when choosing the seat post it sits on as well. Because they’ll be used on mountain trails, seats should be thin, aerodynamic, and fairly solid. The crank is the portion that connects the foot pedal to the chainring and provides you with power to get moving. Cranks are available in multiple sizes. It’s a good idea to choose cranks based on where and how you’ll ride, as the length directly affects power and speed. 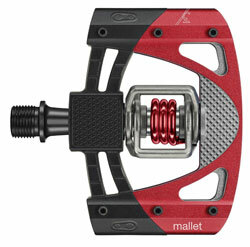 Pedals connect to the cranks and have direct contact with your foot. There are caged, platform, and clipped options. For beginners, platform or caged pedals are recommended because they provide quick bail-outs. Clipped pedals make it more difficult to get out at a moment’s notice because they are attached to the shoe. Made to provide stopping power and speed control, brakes are a vital component that needs careful consideration. Mountain biking often has bikers riding at high speeds in dangerous terrains, so it’s important to choose high-quality brakes. The two main types of brakes are rim brakes and disc brakes. Rim brakes are cheaper and lighter. Pads make contact with the rim of the wheels to slow it down. While effective, they don’t perform well in wet conditions. 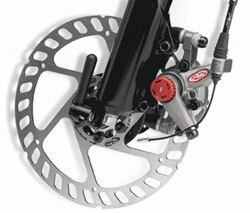 Disc brakes affect the center of the wheel for better performance, but they are heavier and pricier. 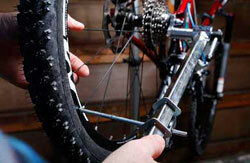 The most common brakes for mountain biking are hydraulic disc brakes due to their versatility and power. Handlebars are what give riders control of their bike. They help with steering and often house controls of a hydraulic brake system and gear shift system. 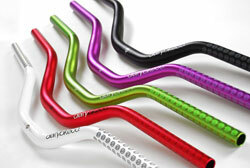 The size and design of the handlebars have an impact on the control you will have. Typically, they should be a few inches wider than the shoulders. However, different sizes are more suited for particular riding styles. For instance, a wider design is better for freeriding. Of course, the size will have an effect on turning time and handling, so it’s important to choose based on your riding style. The chain and gear system is what drives the bike forward. Mountain bikes are generally comprised of complex gear systems to accommodate various riding styles and terrains. The chain is attached to the chain ring and crank system. As you pedal, the chain moves to control the chain wheel. The gear system is located on this wheel and is manipulated by levers on the handlebars. Despite its name, the gear system actually utilizes a set of sprockets. The chain is moved from sprocket to sprocket as you shift gears. With a bit of careful planning and an understanding of the required parts, you can make a high-quality bike that doesn’t hurt your wallet. Custom built bikes provide more versatility and control with price and design. Not only that but the added joy in the building process have made them increasingly popular among bikers all over the world.